Fall-planting bulbs are some of the easiest flowers to grow. With planning, and some patience, a novicegardener can create a spectacular spring display. As winter nears its end, the progression of colorcan create an eye-popping landscape that will make you the envy of the neighborhood. Below is a listof general questions we’ve compiled from phone calls, letters, and emails that can help clear up confusion and answer some misconceptions about planting bulbs in the fall. Simply put, fall planting bulbs are flower bulbs that are planted during the autumn to provide color andflowers the following spring. Crocus, hyacinths, narcissus, and tulips are all representative of fall planting bulbs. These bulbs need the cooling period of winter in order to bloom, but also need time to establish a healthy root system to survive the winter frost. Fall bulbs need to be planted after the temperature reaches 65 degrees, or lower, but at least 6 to 8 weeks prior to a hard frost. Bulbs do best planted in the ground, especially ones that naturalize, but can easily be grown in containers as well with extra maintenance. Planning a bulb garden is not essential; however, with a little research and thought, a showy spring garden can easily be attained. Proper knowledge of the zone where the garden is located will eliminate failure and frustration for gardenerswhen spring arrives. It is important that your customers familiarize themselves on what zone their garden occupies, especially first time gardeners, in order to get the best results. Bulbs planted when it is still too warm often sprout prior to the hard frost, and freeze during winter. Within colder regions, such as zones 1 through 4, or a mountainous region, additional mulch to protect against severe freezing temperatures (20 degrees below zero) is recommended; alternatively, heavy mulching will need to be removed in spring to ensure the flower can bloom and grow to full potential. Bulbs need to be kept in a cool and dry location prior to planting. The warmer temperatures and healthyrains in Spring activate bulbs, so storage in areas that have higher moisture and heat will trigger a bulb to grow. Bulbs with sprouts can still be planted, but the sprout should not be damaged or removed, or else, the plant will not grow. Bulbs are alive when they reach a garden center, and will carry a shelf life of 4months before they can no longer survive. Gardeners can purchase bulbs early in the season and store them at home in the same conditions: a cool, dark, dry location. Storage can be an open paper bag in adark place, like a closet shelf. Earlier in the fall season, the variety of bulbs will be much greater, so you may want to shop early and store them at home until they are ready to plant. Bulbs should be firm when selected, not mushy or soft, as that signals a dead or bad bulb. Occasionallymold may form on the outer skin, but can easily be brushed off and causes no harm to the bulb.Many bulbs will naturalize, and if cared for properly, will return and bloom the following spring: daffodils, crocus, hyacinth, muscari, and alliums, are varieties that will naturalize in the garden. Tulips, unlike other fall planting bulbs, are not native to American gardens, and will not return the following year; they are best pulled and new bulbs replanted the following fall. Gardeners who deal with deer and rabbits can use deer resistant varieties to help curb destruction in their garden: scilla, snowdrops, daffodils, hyacinth, allium, are not favored as meals by wildlife; however, a hungryanimal will eat anything if hungry enough. 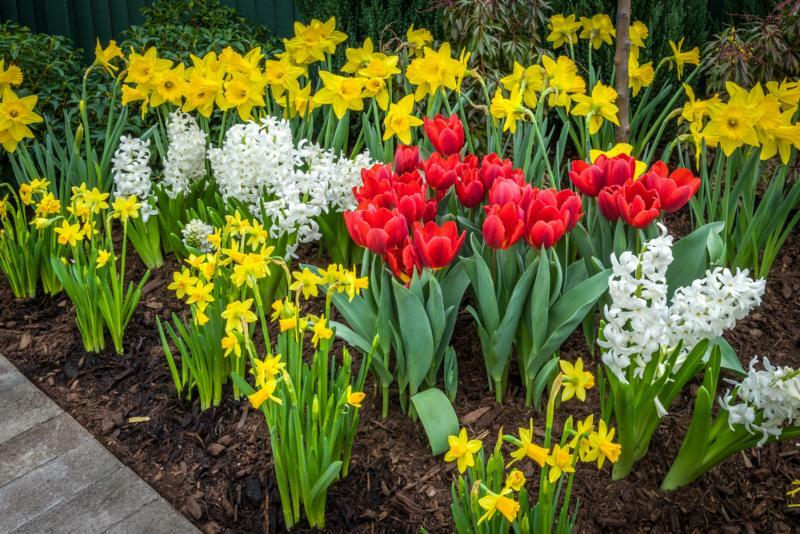 Bulbs bloom at different times throughout the spring, so with some research, an amateur gardener can make a show-stopping display that continues after each flower is spent. Good soil preparation is the key to planting bulbs; some gardeners dig up a larger space to facilitateplanting large numbers of bulbs, while others use garden tools to create holes into which the bulbs will spend the winter. Bulbs are generally planted about 8” deep for larger bulbs, and 5” deep for the smaller varieties; the general rule of thumb is that the depth of the bulb should be 3X the diameter. Bulbs prefer good draining soil, and do not like wet feet, so areas that collect heavy water are not ideal. If using containers, bulbs may be planted in layers based on size. Always place the bulb with the pointed side up, and the flatter side (often with tiny roots) down, cover with soil, water, and let the winter rains and snow take care of watering until spring. Plant bulbs in clumps, or stagger to create larger washes of color. Paying attention to bloom times when planting can help fill in spent blooms in the garden and create a show of color that lasts all spring. The simplest advise here is: “Do Nothing.” After the flower has bloomed and faded, do not cut downthe leaves and stalk. Let the plant die back naturally and brown out over the course of late spring and early summer. During this period, the flower bulb will gain back all of the energy spent in flowering, and continue its life cycle. A popular belief is that bulbs should be tied back, however it is not necessary, it is better to let them be so that they can prepare for the next season. Once brown, remove the spent leaves. Some bulbs, after time, will need to be dug up and divided, to ensure continued flowering. Fertilizer does not need to be applied in the first year, but down the road, bulbs benefit from a feeding using a specific mild fertilizer designed for bulbs. Most general fertilizers are too harsh for bulbs. One final tip is that if you do not like to see the dying foliage, we recommend planting your spring flowering bulbs among perennials. As the spring flowering bulbs die back, the summer flowering perennials start to emerge and hide the dying foliage. Are you ready to plant and start designing this fall? Visit DigDropDone.com for great information and inspiration for your spring garden.